I miss the backcountry. The more I think about my last trip the more I know I need a back roads vehicle I can camp in. Not quite exact. One my DW will camp in. Her backpacking days are over. I'm trying not to complicate this. Right now the design is a simple platform for my F150 that will somehow extend over the tailgate for sleeping. Perhaps with a air mattress or just my Thermarest. Perhaps hinged. Then I got to thinking about a little storage, water, a camp stove . . .
One issue my DW thought of is all the dust that fills the back of the truck heading down the roads. She's not keen on sleeping in that. 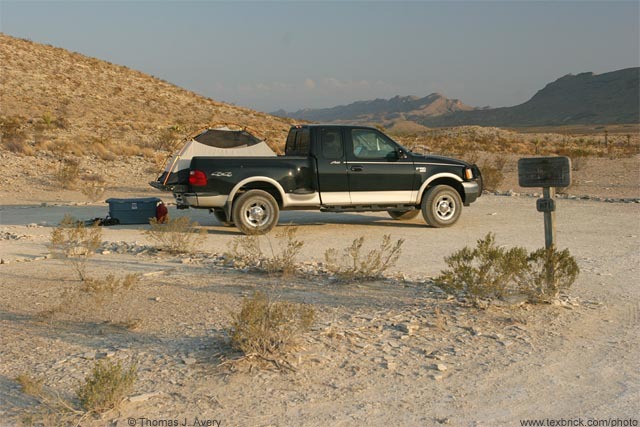 is the bed of your truck covered at all? I have a "back flip" cover on mine and dust got in there big time. there is a tailgate seal you can buy to help keep dust out from the tail gate, but I still had dust get in the bed some how, probablly need some magnetic strips to put around all openings to help keep more dust out. Ive seen a truck with a camper shell the owner made a hoist system to lift the shell three feet up. Had a roll out in the bed with his stove, sink and dish holder. Then the platform above it to sleep on. Was a really neat setup. Cool idea. I have the short bed so the tailgate needs to be down to fit my 6'1" body. I'm avoiding the shell because I want to sleep open air. (cowboy above ground). I once put a small 2-man Kelty tent in my bed with the tailgate down. That worked okay, although I had a step-side F-150 at the time, so it was just right for one person. I was thinking about using my Kelty Zen if the weather turned bad. It's not a dome so holding it out could be a problem.